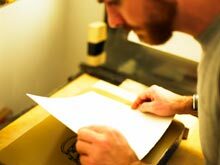 Hole Editions - a collaborative printmaking workshop, specializing in hand lithography. Feb 4th/5th 2016 - new press arrived/installed. 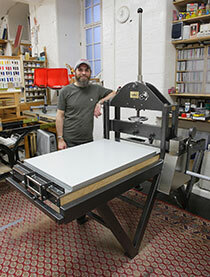 Hole Editions is a collaborative printmaking workshop, specializing in hand lithography. We work closely with artists to realise their ideas. 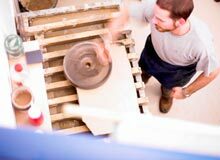 By handling the technical considerations, processing of the stones and plates and the editioning of the prints, artists are able to focus their energies on the creative aspects of the project. We often collaborate with artists who have little or no printmaking experience and who do not usually work in a collaborative way. Artists may face new challenges and materials. Both printer and artist have to be flexible and willing. This allows for creativity, experimentation and for the artist to push the boundaries of their image making and working practices. A collaborative printmaker is a guide to the artist through the complexities and technicalities of the process, while also being sympathetic to the art. 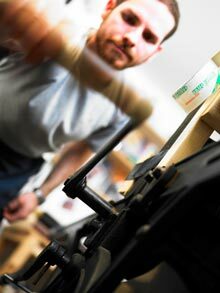 All our work is hand printed and original. We use the most light fast inks available and high quality acid free papers. Editions are carefully curated and documented. Upon completion of projects the stones and/or plates are effaced, thereby preserving the integrity of the edition and ensuring that no further impressions can ever be printed. Documentation sheets usually accompany all editions, they are always available upon request. Hole Editions is the imprint of Tamarind Master Printer Lee Turner and was established in 2005.